Since we started Frogbox in 2008, we have rented over 2 Million moving boxes, that’s a lot of moves! When founders Doug Burgoyne and Trevor McCaw first began meeting to discuss business ideas in 2007, they didn’t know that Frogbox would be the premier brand for moving boxes and supplies in North America. Ten years later and the founders’ vision remains the guiding light for our brand. We’ve achieved many important milestones in the 40 cities we currently service, Frogbox is known as the best way to move by those who have tried our service. Delivered 1 million boxes in the first seven years and another million in the next three years. With that pace by 2020 we will have delivered well over 10 million reusable Frogboxes. This is no small feat! 2082 Days worth of time saved not assembling boxes. Enough tape to go to the moon and back 16 times. Enough cardboard to fill 130 airliners (747’s). In 2018 we want to Celebrate the last 10 years of success with you – we are kicked off our celebrations on Earth Day, April 22nd 2018. From May through August we will be out in our communities sponsoring everything from cycling and running events to trade shows and eco-fairs. Keep your eyes peeled for your local Frogbox franchise out and about this summer and stop by and say hi! 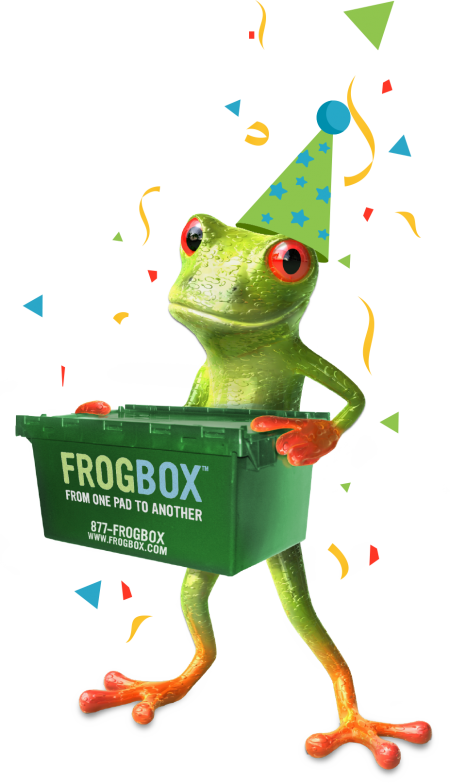 All Frogboxers know that once you try moving with Frogbox moving boxes and supplies, you won’t go back to cardboard ever again! Frogbox has also become a leader in the moving industry by referring thousands of our customers to vetted, trustworthy, moving companies. We get feedback on a daily basis on the top movers in over 40 cities – we use this data to help you choose your mover wisely. 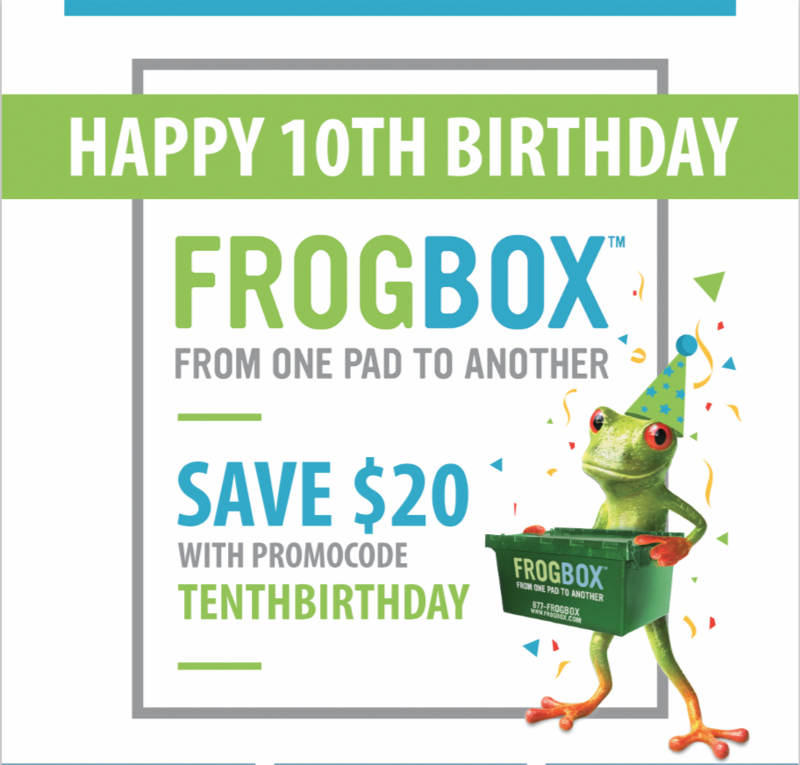 Use promocode “Tenthbirthday” to save $20 on your next Frogbox order.